In a likely gang-related incident, three men were attacked without provocation and stabbed Saturday in a Food 4 Less parking lot, according to the Paso Robles Police Department. The victims survived the attack, but the suspect managed to get away. Shortly before midnight, a melee started outside the Food 4 Less in the 1400 block of Creston Road. Officers then located and detained several suspects who were fleeing the area on foot and in vehicles, but they did not find the attacker. Police describe the attacker as an Hispanic male who is approximately 25 to 30 years old. He was last seen wearing a red shirt and tan pants. The three victims drove themselves from the scene to a local hospital. Two of the victims were hospitalized with non-life threatening stab wounds, and the third was treated and released. 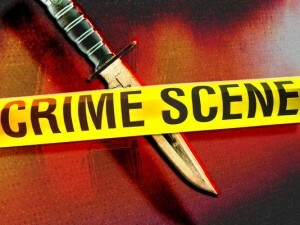 Paso Robles police are currently working with the county gang task force to follow-up on leads related to the stabbing. Investigators request that anyone who has information about the incident call the police department at 805-237-6464. Doesn’t anyone else see a problem with the story described in the article? Which of these scenarios is more likely? Three men (apparently the only witnesses) were attacked in a parking lot, in the middle of the night, without provocation by one knife wielding thug. The injured “victims” drive themselves to the hospital. When police arrive, they tell the story describe in the article. Or, isn’t it more likely that one man was attacked in a parking lot, in the middle of the night, without provocation, by three thugs? His response was to initially defend himself with a knife (fight), and then run away (flight). The injured thugs drive themselves to the hospital. When police arrive, they tell the story describe in the article. The Tribune ran an article today front page editorial about how how everyone loves farm products but dont want to live near the farmworkers. Then they reported this stabbing on page 3. Stabbing was front page news in a little podunk place like this and their front page editorial would have worked better than a brown corn cob or could have been put to use lining the parakeets cage. I’m pretty sure if the perp was a farm worker he wouldn’t be out at midnight. Probably just your everyday thug.